This Episode, #24 , is another “bonus” episode that is a little less formal than usual episodes. Again, I hope you can forgive the more casual style and above all the lower audio quality – this was another episode squeezed in between visits to relatives and loved ones! The start of a new year is a natural point at which to think about big-picture strategy and overall approach to business and business building. If you like this approach, let me know in the Facebook Group and I’ll give more summaries of powerful business strategy books I’ve been reading. This episode is about The Star Principle, as espoused by the wonderful business strategist, Richard Koch (who is a fellow Brit!). This principle is behind Richard going from £3 million to above £150 million in net worth, with 8/16 investments making money, one with an astronomic return! (venture capitalists expect 1 in 10 to make money). This is almost unheard of – this guy utterly walks his talk! Ben Cummings was a star student of Amazing Selling Machine as sold by Jason Fladlien. He now works with Jason and runs his own courses, masterminds, etc. Perry Marshall (who is an excellent Adwords expert and teacher) interviews Richard Koch here in a very extended, natural interview. Totally worth viewing. Perry Marshall is also publisher of the best-selling book ever on Google Adwords (let me know if you would like to know more about this book). STAR business: High growth and Market Leader. Action: INVEST! Cash Cows: Low Growth Market but Market Leader: Protect! 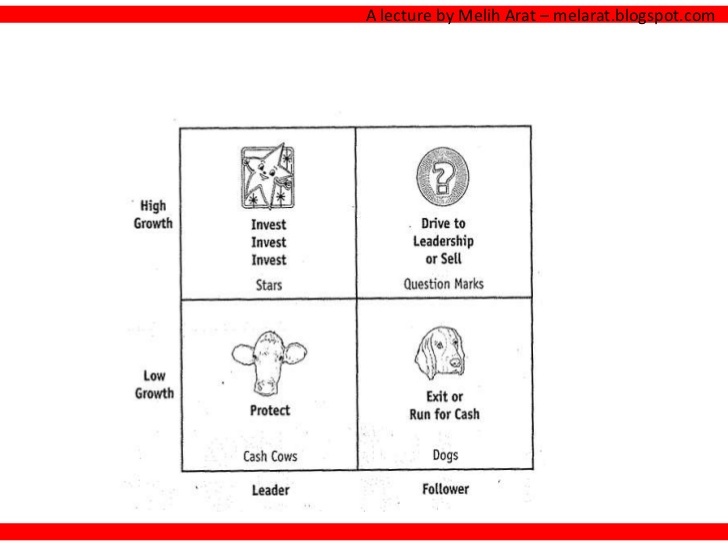 Question marks: High Growth BUT not leader: Drive to leadership or Sell. Dogs: Low Growth and Follower: Exit or Run for Cash. So how does this work for an Amazon business? Follow your industry/market magazines, websites; go to meetings, conventions, etc. Once you have had a product or products live for a time, review your products. Aim: Determine whether you have found a Star, Cash Cow, Question Mark or a Dog! Monitor your position on Amazon in response to main keywords for your product(s). spend aggressively on Amazon ads in launch phase BUT monitor profitability like a hawk so you know what the breakeven price will be. Above all, focus on being no. 1 for any keyword that has a certain amount of demand and is profitable!! #6 in main market is nice; #1 in a niche is better IF it is still profitable. Reduce Amazon ad spend to a minimum. Discontinue Facebook Ads, Google Ads etc. if used. If you need the cash back out to invest in a product that has proven to be a Star or a Cash Cow, consider lowering the price to sell out faster and get the cash back out faster. After your launch phase (so you have hit 50% of the no. of reviews of the No.1 product and have got onto page 1 for top 2-3 keywords), scale back costs so you make profit! ACoS under 100% does NOT mean you’re making gross profit!! ACoS needs to be substantially less than the gross profit margin. E.g., if your gross margin is 33%, ACoS MUST be under 33% to be making a profit. A star business or a cash cow should have decent profit margins after launch phase. If it’s only breaking even, see if you can reduce your costs. Above all, monitor and reduce your spend on Amazon Ads!! These are things that at first you probably can’t neatly formulate – but you should be using your experience to build these formulas over time and then refine them based on reality, not theory! This Episode, #20 , is continuation from episode #18 of my personal Sourcing Mistakes and the solutions I’ve found. Choosing Suppliers, Communication, handling Financial Arrangements, and Quality Control and Freight/US Customs can be some of the scariest things for a newcomer to a product-based business. They are also the source of many of the frustrations and blocks to progress for any Amazon FBA business owner, however experienced. Here I continue to share with you all the mistakes I personally have made, and the solutions I had to find! If you have similar stories to tell, please share them with your fellow Amazon sellers, either here, or in our Facebook Group. Let’s help each other! For a detailed step by step guide to the sourcing process, listen to Episodes #6-#10, which are part of the 10-step Amazing FBA Startup System. Getting exactly the same kind of product! Letting supplier change carrier to non-standard. Picking a product needing or including batteries! NEVER send in uninspected products to Amazon! The Serenity (calm) to accept the things you cannot change; The Courage to change the things you can; and The Wisdom to know the difference. This Episode, #12, deals with your Essential Daily actions to run and grow your Amazon FBA Business. It is part 10, the final part, of the “Amazing FBA Startup System”, which is a very highly structured series of podcasts (with very detailed show notes) designed to take you from zero to having a product launched and selling on Amazon. If you haven’t already listened, you’ll want to at least listen to episode #11, which deals with Product Launches . Emails – do this AFTER you’ve checked Amazon & Done your most Important Tasks for the day! Don’t do it first! Facebook Fan Page – update with posts, drive likes, etc. This Episode, #10, is part 8 of the “Amazing FBA Startup System”, which is a very highly structured series of podcasts designed to take you from zero to having a product launched and selling on Amazon. If you haven’t already listened, you’ll want to at least listen to episodes #6, #7 & #8, & #9 which deal with Sourcing from China. Ideally, listen to the whole Startup System, so start from episode #3. **STOP PRESS** In response to popular demand, in September 2015, I set up a Facebook Group for Podcast Listeners! To join the group, click on this link and put in your request to join! Come join it while it’s still an intimate group and get personal attention from me! UPC – Universal Product Code – this is what most of us think of as a barcode and it’s found on any products in your local supermarket. In fact, the code behind it can be expressed as a barcode but it’s the code itself that makes the product unique. It’s an important distinction between the CODE itself and the BARCODE FORM that expresses it because we have several forms of code in Amazon which can be in barcode FORM. The purpose of a UPC is, as the name implies, to be a globally unique and universal code to identify a particular model or product. SKU – Shelf Keeping Unit – This is a near-universal generic Retail term for a way of tracking products in warehousing or in retail spaces e.g. supermarket shelves. ASIN – Amazon Identification Number – this is a code that only exists within the Amazon eco-system. However, within that system, in theory the ASIN is universal worldwide. I say in theory as I haven’t extensively tested that. But I have got one product in UK that was on Amazon USA and it does indeed have the same ASIN. So it does seem to be true. FNSKU – The FBA SKU (FNSKU) is an Amazon product identifier for products that are Fulfilled By Amazon (the FBA of this podcast’s title) . The FNSKU identifies the product as yours. You need an FNSKU in order to create FBA Inbound Shipments, which is the next stage. Inbound Shipping – simply means freight from anywhere in the USA (in our case, from our receiving warehouse) to whichever Amazon warehouse or warehouses Amazon chooses to store your products in. This episode is focussed on Product Listing but you’ll want to revise the notes for Episode #9 if you’re about to ship product to your USA warehouse. But we are going to repeat what I said about creating inbound shipping labels for your warehouse to use. Navigate to the “Inventory” tab, click on Create A Shipping Plan. Follow the process. If you want me to do a detailed video walk through, please ask me and I’ll do it! You will input the size and weight of your cases (cartons) and the number of them (and no. units/carton). Amazon will automatically assign your products to (a) specific Amazon warehouses(s). You just need to fill in all the info, click “Create shipping Plan” & then send the resulting PDFs to your receiving warehouse. They should then complete the process of getting your products to Amazon. Voilà! You have product live, ready to sell!! I’ve included the warehousing and inbound shipping info here as it completes the process of getting product from your supplier to Amazon. Get professional photos done of your product. Use your sample while you are waiting for your bulk order to be manufactured, shipped and clear customs/be received by warehouse/ship inbound to Amazon. I use Brian Cottam, who has done shots for many big names including Tesco and Argos. He’s got a real eye and is a perfectionist, plus a fun guy to deal with. UK based. Try to get a photo of someone using the product. Note that for some reason, Amazon dislikes just someone’s hand plus product. Odd but they did actually penalise me for it. I wouldn’t get too worried but it’s a small point. Try to look at the sample yourself from various angles so you can suggest angles to the photographer. A good one will have their own ideas but you might as well be as clear as possible. Use all 9 photos for Amazon (so get your photographer to produce enough shots for you to choose 9 to then go to post-production, where you photographer should clean up and generally enhance the shots. So maybe 20-30 shots total, of which you choose 9. Make sure you get at least 1000X1000 pixel size shots. That’s so they are zoomable on Amazon, which shoppers really like. Get your photos done first. Get the packaging blue print from your supplier for your designer. then the supplier will start manufacturing the OEM (Private labelled) product and OEM (Private Labelled) packaging. If you don’t want this delay, order a small order (say 200, 300 units) of unbranded units, get your product photos done and get the things produced and listed! You can then go back and get your designer working on nice packaging for your product while you are getting reviews, getting ranked and getting in cashflow. This is the approach I’ve been taking with my 2nd product – I’m just waiting for 300 units unbranded now and am only going to start the branding process once they are in stock and selling. My designer is Amanda Reid of Clear Moon Studios. Really friendly, has a great eye (she has a fine arts degree), knows how to create packaging for Amazon products, how to communicate clearly with you and with photographer, etc. Brian and Amanda are actually friends so they communicate well with each other. My dream team – highly recommended. Many people have had success with fiverr.com or 99designs.com – I can’t speak from experience as I’ve not yet used either. The main thing to focus on with this is two areas: shoppers and keywords. You need to think what words will help a shopper looking for your type of product. It’s not rocket science but try out a few different keywords in the search and see what comes up. What titles are helpful to you? Using AMZTracker (cost around $25 a month), start tracking which keywords my competitors on page 1 (and maybe page 2 if there will be plenty of sales still) are using to get found. This is incredibly powerful information. Decide which of these keywords to target, bearing in mind that the most in-demand ones can be expensive to advertise for. Look at the competitive landscape. Is there a keyword that is not dominated by a competitor at #1 but which has good search volume/sales associated with it? (use Jungle scout to check sales on Amazon , which is a tool you probably last used a lot in Product Research. See Episode #3 notes if you haven’t already). Put as many of these as you can into the Title, especially the Bullet points and above all in the Product Listing. Very important keywords need to go in all 3. Important keywords in both Bullet points and Description. Least important but still valuable keywords in the Description only. Use AMZTracker to see how your listing is doing in terms of keywords. It’s really important to optimise your listing so that you maximise Conversions – the percentage of visitors to your product listing page that turn into buyers! In the next Episode, we’re going to talk about the next stages- Launching your Product: Getting Reviews, Driving Traffic to the listing, starting the easiest and most powerful way: Amazon Ads! This Episode, #9, is the 4th of 4 Episodes specifically dealing in detail with Amazon Sourcing from China. It’s also part 7 of the “Amazing FBA Startup System”, which is a very highly structured series of podcasts designed to take you from zero to having a product launched and selling on Amazon. If you haven’t already listened, you’ll want to at least listen to episodes #6, #7 & #8, which deal with Sourcing from China. Ideally, listen to the whole Startup System, so start from episode #3. It’s all about the Commercial Invoice (CI), folks! Everything in the final stages of documentation (meaning anything you or your supplier write to each other, broadly) is leading up to the CI. Of course in practice, you can look at a so-called “final” commercial invoice, realise you or your supplier have made a mistake, and go back to them and get a correction. But it’s a very good discipline for both you and your supplier to get documents right first time. The Chinese have a strong respect for written documents, so use that to your advantage. It’s all about 2 things: clarity of what you are both agreeing; and holding your supplier to that agreement. So do your best to do any wiggling, renegotiating and corrections before you finally have the Commercial invoice. Draft Purchase Order Email – this is of course not a technical term! But I put it in as it is a prelude to the Pro Forma Invoice (see below). So you need to be extremely precise in what you ask to be put in the PFI. See below for an exact list of all the info you need to put in the email. Pro Forma Invoice (PFI) – basically a draft Commercial Invoice (see below). As it is a prelude to the CI, check it very carefully. Purchase Order (PO) – your business’s formal request to buy goods. This is a very important document so you need to basically do a “draft PO” by sending a very detailed email to your supplier (details below), so that you get a good quality PFI back and then your actual PO will be accurate. Commercial Invoice (CI) -this is the final document to result from all your back and forth before money gets sent to the Supplier and then goods are manufactured then sent to you or your warehouse. It is the final and most crucial document. The word “Invoice” in normal business life implies a straightforward document. Of course accurate invoicing is important, but there are not too many consequences if there are errors, as they can be corrected with an apology. However, the CI can’t be corrected once it is printed and fixed to all the cartons of your precious products, and it is the main document that will get goods through U.S. customs -or cause issues and delays if it is wrong. So it is a much more crucial document than a normal invoice! Make crystal clear to your supplier that your UK address is NOT the delivery address! Have the two different addresses in separate parts of the form. Make it clear if you are making the payment of balance dependent on successful product testing/inspection. Spell it out. I’ll put a sample of each type of document up in the next few days. I first dealt with this in Episode 6, because even at that stage, when first comparing potential suppliers, you need to be aware what prices they are quoting mean so you can compare like with like. At this final stage of negotiations and placing the order, it’s more critical to be crystal clear exactly what you are getting. 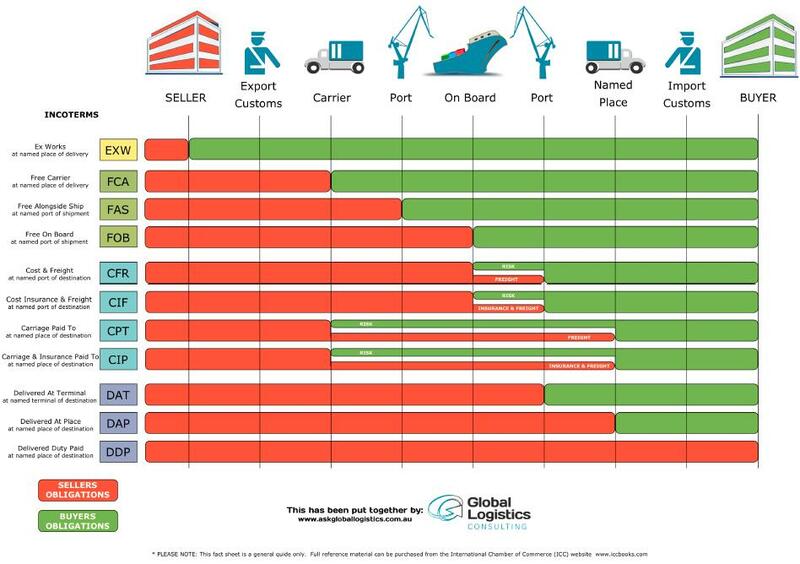 “Incoterms” are internationally agreed freight terms. Chinese Suppliers are familiar with some of these, although as ever, they tend to use them in their own way. There are 11 incoterms, each with a unique 3-letter abbreviation. The most important thing each does is: to define precisely when the responsibility for the shipment passes from the Seller to the Buyer. You can further split that into Risks, Responsibility and Costs but I don’t believe you should overthink this at this stage of knowledge! Here’s a chart showing the detail if you want to educate yourself. EXW – “Ex Works” – this is the price straight from the Factory Gates. I would never advise you buying on these terms because it means you would have to engage a Freight Forwarder to get the product through all the hoops (clear Chinese customs, get put on board plane, get freight plane over to USA, clear USA customs, etc. etc). It is useful sometimes at the sourcing stage for a like-for-like comparison for price between different suppliers. But don’t agree to it at this final stage. FOB – “Free on Board” – The Seller will pay for Land transport to the port, export customs, and loading on board the ship. This technically can only be used with Sea Freight but the Chinese use it all the time for sea or air freight. DAP – “Delivered At Place” – sometimes (incorrectly) called “DDU” – Delivered Duty Unpaid (I am guilty of using this term too, possibly influenced by one of my suppliers!). This means the supplier undertakes to do everything necessary to deliver your products from their factory door directly to your warehouse, EXCEPT for clearing U.S. customs and paying U.S. import duty. This is the method I have used so far with both of my current suppliers and all my imports (6 to date). I like it because it takes care of most of the issues, but it still can leave you holding the baby with the U.S. customs. It is my recommended method unless you can get DDP (see below), which is even more straightforward for you. If you use this method, you will almost certainly get a better freight rate than if you asked for it yourself. That’s because your supplier ships probably 100X more volume per month than you are importing. However, you can check this price is reasonable by opening an account yourself with DHL (or Fedex or UPS or whoever they use for freight), and getting a quote for air freight to your warehouse address. You need to open an account with DHL (or Fedex or UPS) anyway so you have a way for them to easily invoice you for customs duty etc., so you might as well get a quote while you do that. You’ll need to know the exact weight and dimensions of each (packaged) unit, or the weight and dimensions of each carton=case of products (and of course the number of units per carton). Then you can calculate the cost per unit and the total cost. For reference, I’ve generally been charged about 7-8 USD per kilo for air Freight DAP to Portland, Oregon. DHL/Fedex or UPS only, folks! It’s really important if you use this method to only work with a supplier who will work with one of the standard courier companies: DHL, Fedex or UPS. That’s because of customs clearance in the USA. If you set up your own (company’s) account with DHL, they can pay for duty and customs charges upfront and will invoice you or charge you directly for it. This means you don’t need a customs broker to clear U.S. customs. If you allow your supplier to use any courier company that uses a normal airline, you will need to use a customs broker, meaning more costs and more complications for you. SPELL OUT to them that they are not to do this! Guess how I learnt about this! DDP- “Delivered Duty Paid” – This is the De luxe and simplest of all Freight terms – your supplier will pay for and be responsible for everything from their factory gates up to your warehouse gates, including Customs duty and any customs clearance costs. I haven’t yet found a supplier who is willing to supply on this basis, as it means they are exposed to the vagaries of U.S. Customs. BUT if you can find one, I totally recommend this unless the price is outrageous. It means that you effectively don’t have to think about the Freight part of your supply chain and avoid any potential complications with the U.S. Customs. This is possibly the most worrying/stressful single area of importing, but if you get your paperwork spot on, you should have few problems with it. I’ve only had problems so far when the supplier didn’t use a standard courier as discussed already. Duty Calculator www.dutycalculator.com As the name implies, you can calculate the import duty %age that any product attracts. Just follow the simple prompts – which country importing from? which to? Product description? etc. Duty rates vary from 0% to 37% but I’ve only found between 0% and 6.5% for my products so far. Only 3 credits for free so use only when you’ve shortlisted to 3 product types in product research. Then use again at this stage to double check your costs for your Profit & Loss calculations. This is something I’ll go into in more detail in the next episode, along with Amazon Inbound Shipping. But I’m including both here to complete the end of your Supply Chain. Once you’ve got products to Amazon, you’ve completed the end of your Sourcing Phase of the Startup process. If your warehouse is experienced and competent, Like ECM or FBAI, it should not be a big deal for them to work sensibly with you. After all, for the first time in a while, you’re dealing with native English speakers (for the most part, anyway!). Huzzah! Also, most places are experienced with Amazon’s requirements. a. that you know what services they can offer. c. that you communicate to the WAREHOUSE exactly what you want. Try to agree it all upfront. That’s better for (i) budget planning and (ii) smooth working & quicker timescales with your warehouse. However, stay in touch with them and if you need extra services last minute, they are normally happy to do those. Just expect a small extra delay if you do this. First time out especially, you’re likely to need to tweak things. Don’t give yourself a hard time- just keep moving! I’ll cover this in more detail in the next episode, but you need to know about this at this stage. You will need to have set up a product listing at this stage. I’ll get into detail of that in the next episode but do the very basic steps, so you can therefore get an FNSKU, and set up Inbound shipping. A crucial Amazon term is FNSKU – The FBA SKU (FNSKU) is an Amazon product identifier for products that are Fulfilled By Amazon (the FBA of this podcast’s title) . The FNSKU identifies the product as yours. You need an FNSKU in order to create FBA Inbound Shipments, which is the next stage. To get the FNSKU, set the product as Fulfilled by Amazon, and then launch it to Amazon. After a short period of time, Amazon will assign an FNSKU to the product. Click Get FNSKU on the Action Menu of the Amazon Properties page. Inbound Shipping – simply means freight from anywhere in the USA (in our case, from our receiving warehouse) to whichever Amazon warehouse or warehouses Amazon chooses to store your products in. When you create a Shipping Plan (more in next episode), you will input the size and weight of your cases (cartons) and the number of them (and no. units/carton). Amazon will then automatically assign your products to (a) specific warehousese(s). You just need to fill in all the info, click “Create shipping Plan” & then send the resulting PDFs to your warehouse. I’ve included the warehousing and inbound shipping info here as it completes the process of getting product from your supplier to Amazon. However, the place to go into both areas in detail is in the next episode. So click here and listen and read your show notes! This is Episode #8. It is also part 3/4 of the episodes focussing step by step on Amazon Sourcing From China. AND It is also part 6 of the “Amazing FBA Startup System”! DDU Delivered Duty Unpaid doesn’t really exist.But some suppliers use the term. The correct term is DAP – Delivered At Place. This means you are paying the supplier to freight products from Factory gates to your chosen place (in our case probably a warehouse in the USA). It just doesn’t include Duty or other customs costs. During Production Inspection (DPI) — Catch issues as early as possible and point them to the manufacturer. And take samples at random for laboratory tests, in case you need to comply with strict regulatory standards. *Final Random Inspection (FRI)* — Confirm the average quality of a product batch, a few days before the goods are shipped out. The audit is based on a statistically valid sample. It is the most common type of inspection. Packing & Loading Supervision (PLS) — Record the quantity and check the packing method. And supervise the loading method. AQL – Acceptable Quality Limit – Renaud does an excellent job of explaining this in detail here at QualityInspection.org. I strongly recommend you read that whole webpage and digest it. It’s very important to be clear in your own mind about this so you can be equally clear with your Chinese Supplier. He also runs or is part of a business that does inspection and testing in China called Sofeast.com. I have not yet used his business but I am in talks with him about a new shipment so I’ll let you know if I use it, how it is. Amazon defect limits are also set <1% and their definition of defects includes Customer returns as well as any defective units they find in their warehouse. So Amazon is (as usual) very stringent in their quality requirements. However, usual consumer goods level = AQL II, ie <2.5% major defect rate. This is not good enough for Amazon- don’t accept it! Chinese supplier mentality re QC – higher level of quality =higher costs to them so higher to you. If they refuse inspection/testing, walk away! Make payment of final balance dependent on passing QC. And make this clear in all final communications (Skype chat, email etc.) and put it in the Purchase Order! Episode #7 is the 2nd of 3 episodes addressing Sourcing Products, i.e., finding suppliers and ordering and receiving products. It is also part 5 of the 10-part “Amazing FBA Startup System” series of podcasts. The steps in this episode are in part reiterating previous steps but in more detail. The first thing to do once you’ve found up to 20 suppliers is to create an email template, then copy and paste and send it to each supplier (obviously changing the supplier contact name!). Try to do it in one -two work sessions if possible – it’s much more efficient. I am the Buying Manager for Mike’s Cookware Ltd. We sell Cookware products, mostly online on Amazon in the USA. Here is our company website www.mikescookware. com if you wish to find out more. We are looking to add Silicone Spatulas to our product line and your product Model SS2 might be perfect for us. Please can you answer the following questions about your product? 2. What is the cost of a sample? 3. How long does it take to receive samples? 4. Do you accept paypal for samples? 5. Do you accept paypal for orders? 6. Do you use DHL, Fedex or UPS for delivery? 7. If so, What is the cost DAP/door-to-door with DHL, Fedex or UPS to [Warehouse address] in USA for 200 pieces? for 500 pieces? We have contacted several potential suppliers and will choose 3 suppliers to get samples by X date [in about a week]. I would be grateful for your quick reply. Do not come across as brand new to business! Use phrases like “we are looking to add this product line” and “our company”. Don’t say “I’m thinking of” nor “new to business” nor “new to Amazon”. Use simple language but don’t use slang. Keep sentences short (I struggle with this! Edit your message after you draft it). Format properly with Capitals, check spelling, neat layout (come across as professional – even if your supplier doesn’t do any of these things.) Remember that email is easier to read with plenty of white space compared to printed letters. Say you are the Buying Manager or Purchasing Agent or Procurement Agent for “Your Business” Ltd. Even if you don’t yet have a limited company, give your business a name. Sign off with as many company/business credentials as possible, including registered company number (if you have registered a company yet), website address, dedicated tel. no. etc. Size matters! It’s all about appearing bigger and more established than you are yet! Paypal – the simplest, quickest way of making international payments. It also gives you buyer protection. Not all suppliers will accept this because of the cost to them (ca. 4% of sum received) but it is worth offering to pay half of this cost or even all of it. Otherwise, use your bank and do a “Wire Transfer”= T/T – Telegraphic Transfer. Yes, there is small potential for fraud but when dealing with a small amount like $30-80 USD, I wouldn’t worry about it – keep the process moving above all. You can’t control delays due to samples being manufactured or their freight, nor due to actual products being made or shipped, so don’t add any other delays! Details on payments and fraud prevention for actual orders are here in Episode #8. Until you have your sample, you can’t actually get photos done yet, but you can start the process of looking for and negotiating with a suitable photographer. My Photographer: Brian Cottam of Brian Cottam Photography. He has done product photography for various UK companies that household names. Mid priced so not the cheapest, but the shots are of very high quality. High quality photos are seriously important for Amazon listings. He has an excellent eye and takes great care over the details. Also fast and very friendly. Equally, you can’t design packaging until you have decided on your supplier and got the packaging details from them. b. get a professional logo made. This can immediately be used on your business’s website to give a more professional look. Also, the logo will be ready to send to your supplier to print onto your product when you are at that stage. Ask your designer to give you two forms of logo: one ready to screen print onto products and the other web-optimised. Also, ask for black on white and vice versa. If you’re using colour, you may want to also ask for black and white versions. My Designer: Amanda Reid of Clear Moon Studios – UK based designer with a very good eye and very broad experience, including having lived in the USA She has done design work (using templates from Chinese manufacturers)for me and several friends with Amazon businesses so she knows the routine. Very friendly and efficient. She also does website design. I haven’t used her services for this yet but I’m planning to upgrade our company website soon and she will be my first port of call. www.fiverr.com – probably the cheapest and easiest. www.99designs.com – probably offers more choice and better end quality. You basically run a mini “Design competition”. A favourite of some internet business gurus like Tim Ferriss, so not to be sniffed at. 48hourslogo.com – specifically for logo creation, again, probably the cheapest and easiest. Confession – I haven’t used any of the above for design or photography as I have my own trusted people. But I do know people who have had good results with all of the sites listed. Subscribe to the Podcast to get the complete 10-part Amazon Startup System delivered to your favourite device! This Episode, #6, is the 1st of 3 parts dealing specifically with sourcing, i.e., finding suppliers, negotiating, getting samples, and getting product manufactured and sent to Amazon USA. It is also part 4 of 10 of the “Amazing FBA Startup System” series. Sourcing from China – alibaba.com. This is where nearly all private labellers shop. Gold Supplier – Supplier pays $2500 odd to list on Alibaba.com. Not in itself a great safety check, but check how long supplier has been listed. The longer, the better. Assessed Supplier – Which I called “Verified Supplier” in the Podcast. Here is Alibaba’s explanation. Basically, a 3rd party inspection company has been in to check their claims are true and that it looks like a legitimate business. Of course, this being China, we can’t be absolutely certain of the integrity the 3rd party, but it’s another level of check. Onsite Check – on a laptop/desktop, this only seems to show in the sidebar on the Alibaba site. This means they physically check the factory, which is obviously a lot better than just checking the paperwork. Certificates – again, in the sidebar. For certain products, you’ll need certification for the product. E.g. 1, silicone spatula touches food so it will need FDA (Food & Drug Administration) approval in USA. E.g. 2, electric lamp as an electrical item will possibly need certification (More in episode #8 how to find out what certification is needed). Recommended by a friend of mine who is chief Procurement Officer for Europe for a huge company, so worth taking seriously if you’re concerned about supplier reliability/product quality/potential fraud. I found my supplier of my first product here. All the major company information has been checked by Dun & Bradstreet, a very established (nearly 200 years old!) and respected auditing company based in the USA. About as safe as it gets in China/Asia generally. China Importal – This company will try to sell you into a quick pricey service where they will find and assess suppliers for you. I don’t recommend that, but their blog (linked above) and their free email series are useful guides. Proven China Sourcing (eBook) by Walter Hay & Jim Cockrum. This site is a sales page for “Proven China Sourcing”. It costs $97 USD. I bought it and I must say it is no B.S. precise information. But there is a lot to absorb and implement so I only recommend it if you are going to have time to do things thoroughly. If you try to implement everything in this eBook, and can only work it very part-time, you will possibly delay things by months – more or less the trap I fell into. MOQ – Minimum Order Quantity – the lowest number of units that a supplier is prepared to produce in one order. Pieces- this is simply the Chinese preferred word for “Units”, i.e., the number of “copies” of a given product line to be produced. Abbreviated to “pcs”. Private Label Product – A product produced by a manufacturer who will put your logo on the product and/or your design on the packaging. The same as “White Label Product”. This is the essence of the business model that I use and that for example Amazing Selling Machine promotes. That’s because it is technically a “new” product so you can use a new UPC (product code) on Amazon and have a unique product so nobody else can compete for the “Buy Box” (more on this in future episodes). Also you are building your brand every time you sell a unit. OEM –In normal usage with Chinese suppliers, it means the same as “Private Labelled”, ie with your own logo and/or packaging design. In theory, OEM stands for “Original Equipment Manufacturer”. Also in theory, it refers to your own design being produced by a factory. Technically the alternative term for Private Labelling should be “ODM” but I’ve yet to find a Chinese supplier who uses that term. Freight is dealt with in more detail in Episode #9, but I thought it worth putting this in here as you’ll need to understand what prices you’re being quoted during the phase of looking for suppliers and negotiating. EXW – “Ex Works” – this is the price straight from the Factory Gates. I would never advise you buying on these terms because it means you would have to engage a Freight Forwarder to get the product through all the hoops (clear Chinese customs, get put on board plane, get freight plane over to USA, clear USA customs, etc. etc). But as it involves basically no Freight, it means you have a like-for-like comparison for price between different suppliers if you want to be extra thorough. This is the method I have used so far with both of my current suppliers and all my imports (6 to date). I like it because it takes care of most of the issues, but it still can leave you holding the baby with the U.S. customs. If you use this method, you will almost certainly get a better freight rate than if you asked for it yourself. That’s because your supplier ships probably 100X more volume per month than you are importing. However, you can check this by opening an account yourself with DHL or whoever they use for freight, and getting a quote for air freight to your warehouse address. DDP- “Delivered Duty Paid” – This is the De luxe and simplest of all Freight terms – your supplier will pay for and be responsible for everything from their factory gates up to your warehouse gates. I haven’t yet found a supplier who is willing to supply on this basis, but if you can find one, I totally recommend this unless the price is outrageous. It means that you effectively don’t have to think about the Freight part of your supply chain and avoid any potential complications with the U.S. Customs. To check the price is reasonable, get a quote, then go and check all the customs costs. Even if it ends up being somewhat more, I’d still be inclined to take it, just to simplify my first purchase. Again we get into this more in Episode #8, but it is important to try your best to get independent (3rd party) inspection and testing of your goods in China before they get shipped if you possibly can. Since one of the keys to quality inspection is the integrity of the inspection person or company, it’s by far the best to get a recommendation via trusted friends or colleagues. This is when being a member of a community of fellow Amazon Sellers is most useful. Also look among your friends with corporate jobs – you may well find someone who deals with international buying, in which case, they’re very likely to deal with China frequently, since China exports pretty much every type of product in huge quantities. If you’re using a freight forwarder or Customs Broker (about which more in Episode #8), ask them if they have such contacts – that’s how I first found my first inspector in China. However, if you don’t yet have such contacts , Alibaba.com has now started offering a service to find you a quality inspection company – click here to use this service. I have yet to use these but am considering doing so for a new shipment. I’ll keep you posted as to how it works. I’ve paid about $80 a day to an individual. Bearing in mind that a day was enough to inspect and test 80/500 units and thus pass Quality Control for 500 units, that’s a cost of 16 cents or 10 pence per unit for QC – totally and utterly worth it for a crucial part of the supply chain. The only company I’ve foundvia Alibaba.com potentially suitable for my next shipment (that covers my type of product and in the right location) , charges $198 USD a day for full inspection. You’ll need to have your chosen supplier’s factory location to find inspectors of course – at least, the City and Province. If you don’t have products tested in China, then at the very least get them tested in the USA when they land. You will pay a lot more for it and it gives you less control over your supplier. But at least it minimises the number of defective units going to Amazon. That is the absolute must in this business to prevent a. Your account with Amazon being put into bad standing (remember, they want under 1% defect rate), b. lots of 1-2 star reviews and reputation damage.